RoadMovie supports iTunes/QuickTime metadata tagging. Metadata tags describe your video file’s content in a fashion similar to id3 tags for mp3 music. The metadata is then used by iTunes, iPod, iPhone, iPad, Apple TV and other devices. Adding metadata is easy. Just navigate to the Metadata pane using the main toolbar. RoadMovie will use your source file name to find metadata from TMDb. When you go to the Metadata pane, RoadMovie has probably already filled in everything you need automagically. Isn’t that nice! All the fields are editable so if somethings wrong you can easily change it. There’s also a possibility that there are multiple entries found for your movie. You can select the one the fits best from the popup in the title field. If the automatic metadata fetching didn’t find anything useful you can easily search for new metadata. Just edit the title field and hit the Reload button to search metadata for that particular title. If you need to work more closely with your metadata you can launch the Metadata Inspector to get a better view of all the fields. You have 3 options, each will affect where the movie ends up in iTunes or on your portable device. There's Movie, TV Show and Music Video. Select the proper one from the popup if not already selected. If you select Movie your file will be found under the Movies section in your iTunes Library. TV Show will sort under TV Shows and Music Video ends up in Music. You can specify a content rating for the movie. This will affect if the movie will be playable on a device with parental controls enabled. This is the same system that is used in iTunes for movies you rent or buy. Depending on the country you have selected in Preferences->Metadata you will be presented with a couple of content rating choices for that particular country. Just drag and drop any image file into the image well to use as metadata artwork. You can enter whatever genre you like or select one from the pre-defined genres in the list. If you choose a genre from the list it will correlate with the genres in iTunes. This is what it will look like in iTunes. 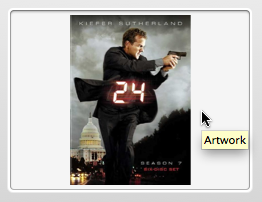 If there’s an IMDb link available in the fetched metadata you will see an IMDb-button in metadata pane. Use that to get even more details about your movie.